Perhaps if it had never shared its engine with the Lamborghini Gallardo, the Audi S8 of 2006-2010 would never had made these pages. But for two extra cylinders, it hasn’t the measure of the Mercedes S63 AMG of the same era, as either a driver’s car or a luxury limo. Fortunately, prices reflect the model’s slightly underwhelming character, with a 58,000-mile 2010-reg S8 yours for £18,995, compared with a 95,000-mile 2007-reg S63 at a grand more. So, for sheer value, round one to the big Audi. 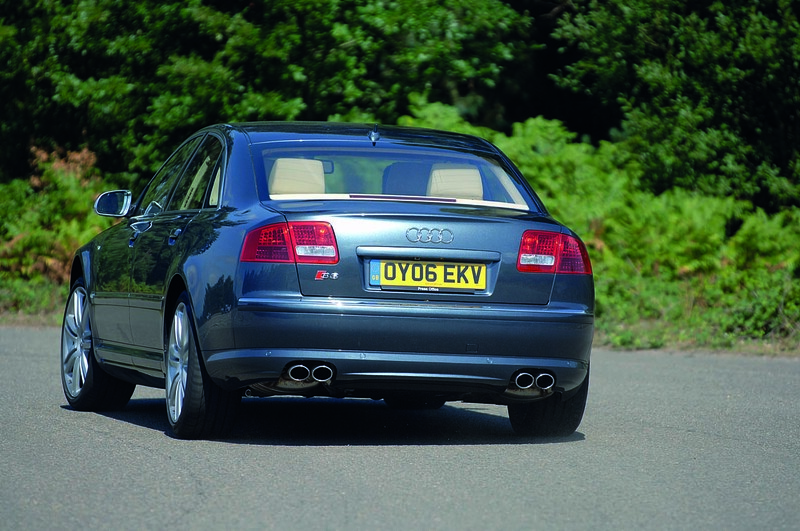 The D3 generation of the S8 was launched in 2006 with that 5.2-litre V10, which was related to the one that found its way into the Gallardo two years later. Only ‘related’, though, because, due to different injectors, manifolds and engine management, the S8 produces 443bhp to the Gallardo’s 552bhp. And although they produce the same 398lb ft, they do so at rather different revs: the S8 at a relaxed 3000rpm – perfect for cruising or, when the fancy takes you, slicing through the six-speed Tiptronic gearbox – and the Gallardo at a frenetic 6000rpm. It’s an exotic lump – and a big one. It fills the S8’s engine bay and is the reason why replacing the starter motor or changing cylinder 10’s spark plug requires either its total or partial removal – which means labour time, which in turn means money. Despite having an aluminium body, engine and suspension parts, the S8 weighs a hefty 1940kg. Expect around 24mpg on the motorway, the late teens around town and single digits when pressing on. Figures like these probably explain why there are so many S8s with low mileages. On the subject of its aluminium body, dents are more difficult and expensive to repair than those in a steel body. On the flipside, aluminium doesn’t dent quite as easily as steel, so they should be rare. The S8 rides on 20in alloy wheels and sport suspension that’s 20mm lower than the standard A8’s. So don’t expect the last word in ride comfort. As for equipment, the S8 wants for little. Depending on the model year, kit includes fingerprint keyless go, a sat-nav, parking aids and an infotainment system. Some later versions have a digital radio. Other features include quad exhaust pipes, gearshift paddles, soft-close doors, double-glazing, leather trim with heated, memory seats and a solar sunroof that powers the interior fans on hot days when the engine is turned off. Must-have options were the Bang & Olufsen sound system and interior Carbon Pack. Check it all works. Better still, given the S8’s complexity and repair costs, invest in a pre-purchase inspection and a solid warranty. 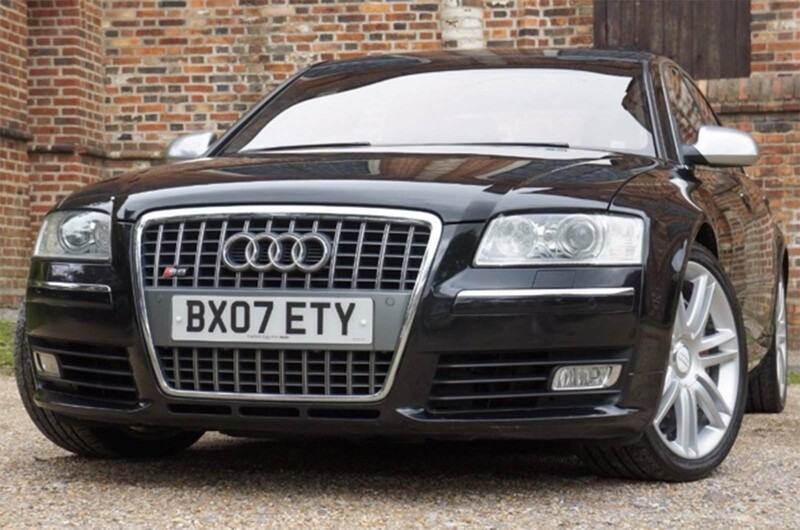 Especially when finished in Brilliant Black metallic, the S8 is an understated-looking express – a genuine sleeper that’s full of surprises, not least the fact that prices start at £7500. Lamborghini-ish power was never so accessible. Engine - Generally reliable but check for troublesome oil pump seals and leaky cam cover gaskets around 100,000 miles. Also, some jobs require complete (new starter) or partial (cylinder 10’s spark plug and coil pack) removal of the engine, so factor that into your costings. Full service history is essential. Check, too, that oil services have been done on the button with high-grade oil. It takes 10 litres. Beware long-life service intervals: the V10 prefers more frequent oil changes. Powertrain - Aggressive launches from traffic lights can cause the Tiptronic gearbox to be noisy and have shift problems. Suspension and brakes - Listen for suspension noises, especially at the front. There are eight suspension arms here (two upper and two lower at each corner). The bushes wear out but aren’t available separately. You have to replace the entire arm, which can cost £250. Fortunately, the rear suspension rarely plays up. Brakes are expensive: front discs are about £460 (and that’s not the optional carbonfibre ones) and a set of front pads £430. Check the electronic parking brake works. The fix could be as much as £1000. Body - Check the aluminium body for dents and dings, which can be tricky to sort out. Rust is unusual except where the body hasn’t been repaired properly. 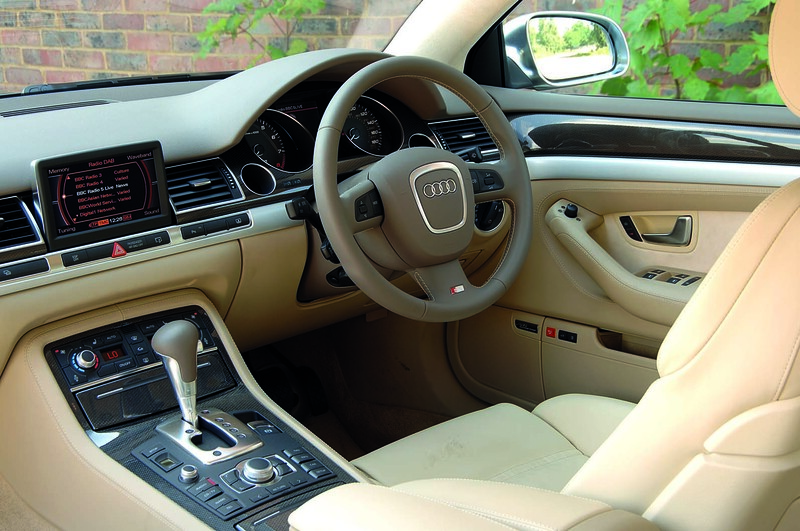 Interior - It’s extremely well screwed together but the S8 had some seriously advanced features for the time, including keyless go. Check it all works. Also worth knowing - Many parts are original equipment (OE) and they’re expensive and occasionally difficult to source. So keep the name of parts supplier Prestige Motor Services (prestigemotorservices.co.uk) in your smartphone. The company breaks A8s and S8s for bits and stocks new parts, including front suspension arms at £121 each compared with OE ones at £250. £7500 - £10,999 - The first 2006-reg cars, most with around 120k miles, including a private-sale example with full service history for £7500 and a similar car being sold by a dealer for £10,995. £11,000-£15,999 - A wide range of early car with lower mileages, including an 80k-mile 2008-reg car for £13,975. £16,000-£18,995 - Low-mileage early cars but also some higher mileage 2009-reg examples, including an 83k-mile car for £16,470. Last 2010-reg cars with around 60k miles for £18,995 or one with 114k miles for £17,500. To change the spark plugs and coil packs is "total or partial removal" of engine, surely some mistake. These are phenomenal value, but will put a smile on your face..! If you can find one that has been looked after, buy one.... I run a 2008 S5 Coupe with a 4.2 V8 engine as a second car (Skoda Octavia estate as a run around), and the running costs aren't as much as you think. Investigate buying an extended warranty (I got mine through Warranty Direct) for piece of mind. You can't beat the sound and the smile when you press the start button and fire up the quattro...! Do it..! Carbon build up is a serious issue on the direct injected V10 FSI, due to the lack of carbon cleaning fuel on the intake valves, which is a benefit of indirect injection. The carbon gunks up the engine from as low as 30k miles, which can result in misfiring when it gets bad and even more expensive damage to the cats. I believe the 4.2 V8 FSI in the RS4/RS5, the 3.2 FSI and the 2.0T FSI also suffer in the same way. Variable inlet flaps can also be a problem on the V10 when they detach and are ingested by the engine.